Learning my lesson from last year, I cut down my book reading goal to 20 books from 25. Thanks to several flights during my trip to Europe, and an inspired purchase of a Kindle during Amazon’s Prime Day (which I hilariously almost lost at the airport), I was able to surpass my goal. 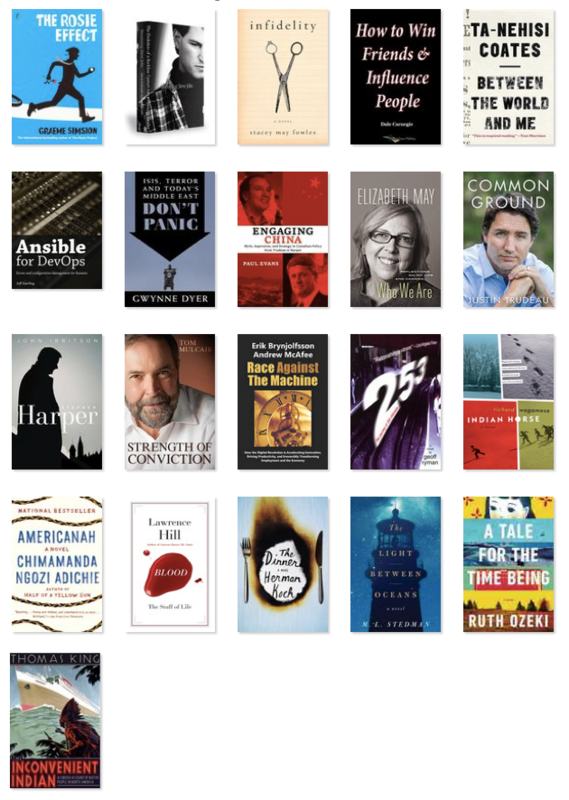 I read Common Ground by Justin Trudeau, Who We Are by Elizabeth May, Strength of Conviction by Tom Mulcair, and Stephen Harper by John Ibbitson all just before the 2015 Canadian federal election. The then-prime minister had not written an autobiography before dropping the writ, and Ibbitson’s biography seemed the best replacement. I was not disappointed. There are overly-sympathetic stretches where progressive readers can justifiably roll their eyes, but it’s an otherwise engaging analysis of how Stephen Harper came to power and used it. I disagree with those who say we progressives let his prime ministership happen, and agree with those who argue that it happened because the forces that led to his ascension (including Harper himself) were stronger than ours. It’s a playbook for how to strong-arm a party and an electoral system and a political culture into getting what you want. It was my co-favourite book of 2015. Between the World and Me by Ta-Nehisi Coates was my other co-favourite. I still remember, a year later, how I felt after hearing the announcement that the St. Louis County grand jury would not indict the officer who killed Mike Brown (all the air in my lungs left in extreme disappointment), but I could never put into words why that decision hurt so much. Coates drives home the point (again and again and again) not only that the American Dream destroys black bodies but how in such a stark way that I, a person who believes he is white, couldn’t fathom before. This is a book tips over what I might have previously believed about the black experience in America and revealed large gaps in my understanding. An important book. Thanks to Amy and Diana for again providing inspiration to write about what I read over the course of the year.